Last week the opportunity came up for us to review the online board game store – Games Quest, and I literally jumped at the chance with both hands grabbing as I love, Love, Love board games and card games. We were given £40 to spend at Games Quest’s online store on whatever we wanted. Thomas and I sat down and perused all the options, which took a long time as there is so much choice. Plus Thomas got carried away having to look into all the others things that Games Quest sell like the toys, books, and puzzles before we were done. 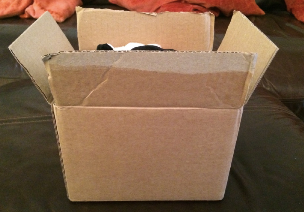 We finally after much deliberation sent Games Quest our picks, and were thrilled to receive our order back in a few days. 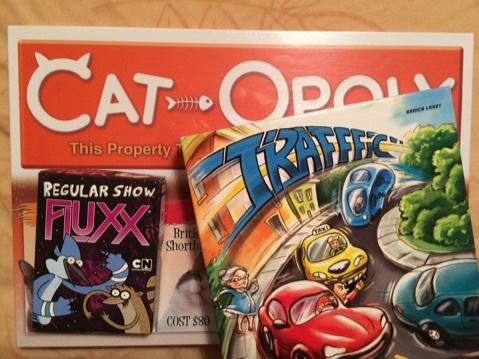 We wanted to go for a few different things so choose a card game in the form of Fluxx – The Regular Show edition, Traffic – which is a puzzle game, and Cat-opoly – a board game. The games actually came at a really great time, as Thomas was off school all last week with a terrible cough and cold. 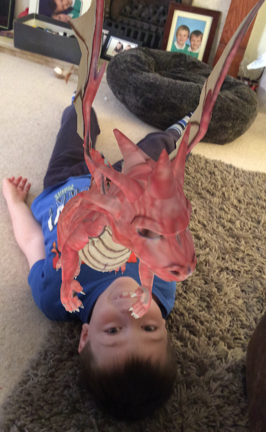 So we had plenty of time to get well acquainted with our new games. Traffic was the first game we played, and it’s a right brain puzzler. The game is all about getting rid of your cards, and you do this by moving your car around the game board. You can only move around the game board when one of your cards matches the pattern the cars make on the board. It’s a bit hard to explain without playing, but we enjoyed it a lot. Cat-opoly is a like Monopoly obviously but with everything cat related. All the tokens are catafied like a tin of sardines and a ball of wool, the jail is now Water, Free Parking is Free Catnip, and all the properties are now different breeds of cats. For a cat lover it is possibly the best present ever. My son Thomas is a huge Monopoly fan, and Huge Cat Lover so he was totally in his element, and is constantly begging people to play Cat-poly again with him. 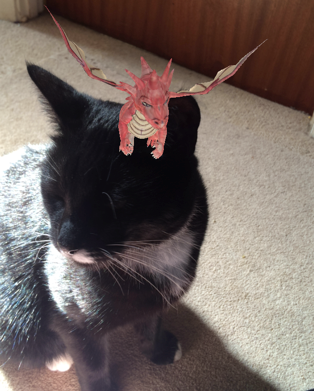 Amazing game which we totally recommend if you’re a cat or animal lover. 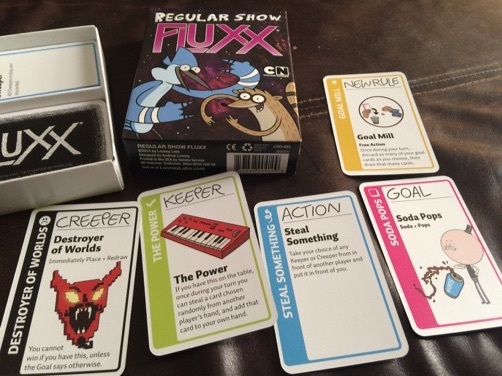 Fluxx is probably our favourite of the lot and the game we played most often, mostly due to our deep love and appreciation of the Cartoon Network series Regular Show. Initially you start playing Fluxx thinking ‘what on earth is going on?’ as every card you draw changes the rules somehow. However after a few games you really get into it, and it’s so fun playing that card which you know is going to wreck your opponents game in an instant. We want to say a big thank you to Games Quest for letting us try out the store, and introducing us to these awesome board games. The awesome people at Games Quest are also giving you the chance to win a £40 voucher to spend at their store. All you need to do to enter is fill in your details on the Rafflecopter below. Competition ends on the 16th December 2014. 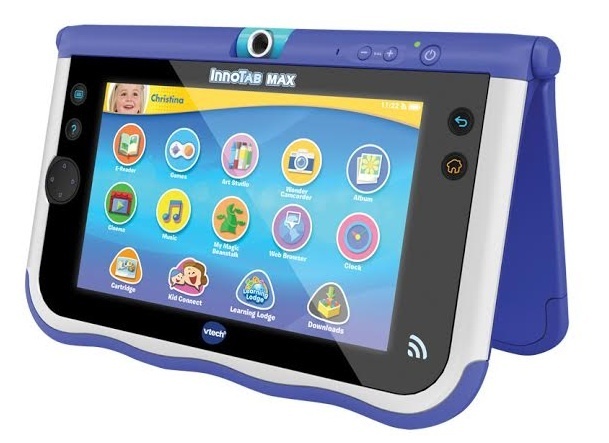 For full details check out the Rafflecopter entry page below. We are so proud that once again we’ve been asked to host one of the Moshi Monsters Series 10 countdown’s alongside a few other fellow bloggers. Everyday from now until the Launch day of 23rd May we’ll be revealing one new Series 10 Moshling. Once we get to the end, it’ll be the big day 23rd May – The day when you’ll be able to rush into the stores and pick up your own Series 10 Moshi’s. Bendy Vendies are happy fellows who cough up colourful gobstoppers when you give them a chocolate coin. You lucky people, the lovely peeps at Vivid Toys and Games have given us a full set of these brand new series 10 Moshi Monsters moshlings to give away. Purchase a series 10 pack and receive free entry to Sea Life Centres across the UK (valid til Dec 2014) with the purchase of one full price adult ticket. Take the voucher found in your blind bag or cut out the voucher from the back of the blister card along to your local Sea Life Centre to redeem the voucher for a day of sea life fun! You can also head onto www.moshisealife.com enter in your unique code found in your Series 10 pack and see if you’ve won one of the heaps of roarsome prizes we have up for grabs including a family holiday to Sea Life in Berlin! We are so proud that once again we’ve been asked to host one of the Moshi Monsters Series 8 countdown’s alongside a few other fellow bloggers. Everyday from now until the Launch day of 18th October we’ll be revealing one new Series 8 Moshling. Once we get to the end, it’ll be the big day 18th October – The day when you’ll be able to rush into the stores and pick up your own Series 8 Moshi’s. They’re finally here, It’s release day everyone! 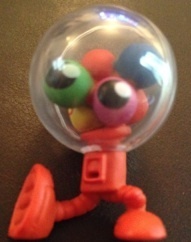 The last couple of weeks unveiling the new Series 8 Moshlings has been a blast as always. Out of all the new Moshlings I think Fitch is my personal fave. I’m still in love with his cute hat and that waffly tail. However now I’m interested in which Moshling is your favourite? To celebrate another wonderful Series of Moshi’s from Vivid Toys and games we have a brilliant competition for you all to get involved in. All you need to do is leave a comment below letting me know your favourite of the new Series 8 Moshling’s and one lucky reader will win a complete set of Series 8 Moshi Monsters. You can get extra entries for tweeting about the competition, and liking us on Facebook. Thanks to Vivid Toys and Games for letting us once again be part of the Moshi Monsters fun. This year for the end of year trip my youngest Jacob was very excited to find he was going to Greenmeadow Community Farm in Cwmbran, one of his favourite days out. He and the rest of his reception class had a brilliant day, and he didn’t stop talking for days about all the animals he’d seen. He especially enjoyed watching the cows being milked, and running after the pigs in the yard. They also have a brilliant play area which all the youngsters were busy playing on for ages, and a cosy farmhouse cafe and farm shop. 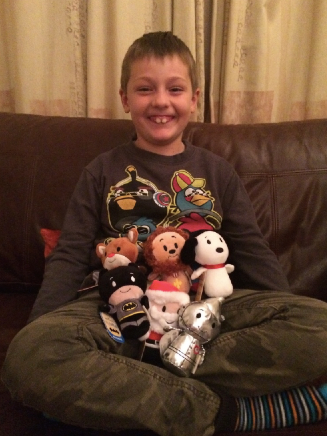 When he got home he went straight to all of his Farm Toys from Britains. We have a Farm Building, some land rovers with trailers, some animals, and a big JCB. He was busy all night using his JCB to chase his chickens and pigs around the room reliving his fun day at the farm. Thanks to Britains the makers of some wonderful Farm Toys you too can experience a day out at Greenmeadow Farm with your family . 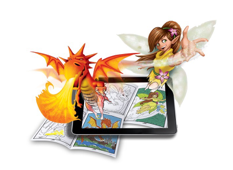 We have 2 prize packages to give away to some lucky readers. All you need to do to enter is leave a comment below all about any of your favourite places for a day trip. When our latest product for review arrived this week, it got us thinking about pirate themed board games. 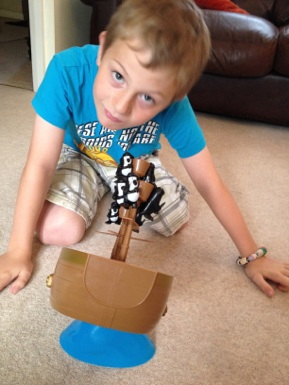 At first we all thought there were loads, but after racking our brains we could only come up with Pop Up Pirate. Well now there’s another to join the ranks – Don’t Rock the Boat from University Games. Don’t worry though these pirates seem pretty harmless, more cute in fact. As these pesky pirates are penguins. The game is really simple to set up and play which is wonderful as it means since we got it we’ve played it everyday. It’s the perfect 15 minute fun filler if your short on time, or you can just go on and on when the time is right. The game board is a boat resplendent with 3 Masts, which sits upon a wave. The object of the game is to balance your pirate penguins on the boat without making it tip and sending them overboard. It’s a really fun little game for all ages, and is great for younger players as there are no rules to follow, just keep your penguin on the boat. A neat little trick is that you can hang the penguins over the side of the boat, and over the rails of the crows nests by their little bandana ties. We all loved trying to perfect that move. It’s not as easy as it looks to get your penguins to balance, but that’s all part of the fun. No one is guaranteed to be the winner, and everyone will eventually get the chance to be the winner. It’s brilliant family fun. 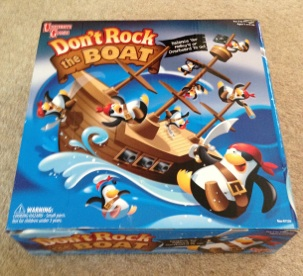 Thanks to University Games we have a copy of ‘Don’t Rock the Boat’ to give away to Toybuzz readers. Entry is simple, just leave a comment with your best Pirate related pun! 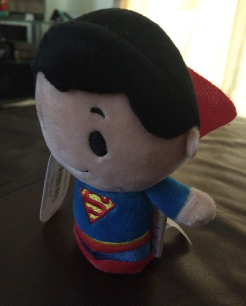 You can also tweet and follow on Facebook and Twitter for extra Entries. Everyone can always tell my boys are doing the school run from miles away. Not because of their shouting and laughing at high volume (although they do that as well) usually it’s the jangling of all the key-rings on their school bag which gives it away. It’s got to the point now where I have a policy of one on/one off as the cacophony of jingles can send me batty when it’s one of those days. 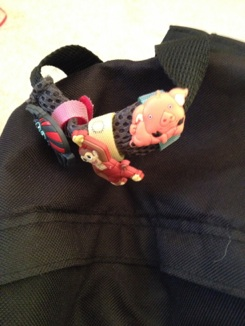 Thankfully their latest gang of backpack buddies make no noise whatsoever, and are also much easier to attach than the myriad of keyrings. The boys can even do it themselves. 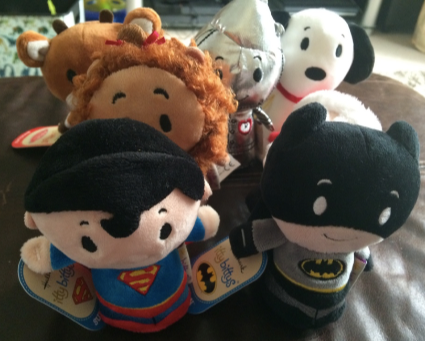 The name for them is Floppets, and these new friends are all set to become a new playground craze. Attaching to almost everything thanks to the easy fastening velcro loop. Children will be able to customise backpacks, pencils, shoes, glasses, or even wear them as rings around fingers and toes. 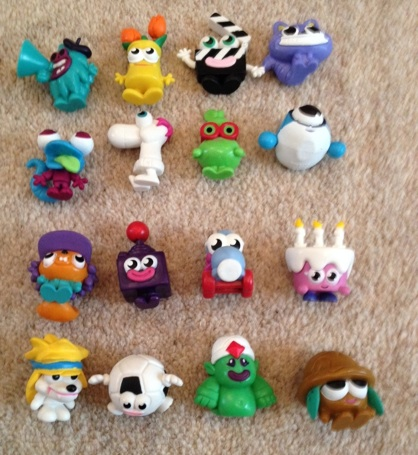 Collect and choose your Floppets from the different Floppet groups, Petlets, Munchkin Monsters and Flop Seas. 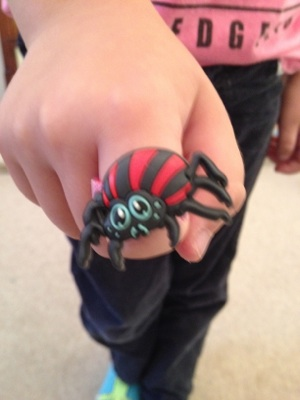 Floppets are a great pocket-money buy at £1.99 each and are available from Toys ‘R’ Us, The Entertainer and W H Smith. 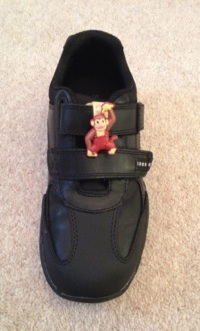 Start Rite Shoes are also including a special Floppets Foil Pack in every new pair of back to school shoes purchased. This offer is available from Harrods, Brantano and other independent stores. Toybuzz has a Set of 5 Floppets to give away to one of our readers. All you need to do to enter is to leave a comment about anything relating to back to school. It could be back to school tips, reminiscing, or pet peeves and gripes.